The Trace begins in Dover, TN on hwy. 79. From there, look for the signs for LBL (Land between the Lakes). If you follow those signs, they will direct you to take a road running to the north called "The Trace." Simply take this road north all the way up to the end in Grand Rivers, KY. Starting at the southern end of beautiful Land Between the Lakes, this ride offers lot's of scenery and places to stop including a bison range, 1850's settlement, lake views and more. Overall the ride offers equal parts of views of wooded stretches and open scenery vistas. Update from "bikesand beards" on 6/13/12: The ride from Clarksville to Dover Tennessee is ok. Nothing special. Once you get onto the Trace things change. The Trace is full of things to stop and see. There is Elk and Bison Ranges, Free Roaming American Bison, Springs, Lakes, A Western Furnace and so much more. Plys the long tracks of beautiful land. And of course not to far into the Trace is the Homeplace. This is a 4 dolalr tour that takes you through an old times living working farm. This farm has houses that you can walk through, and animals that are just walking around. The road through the trace is a 2 lane, blacktop with nice curves and gently rolling hills. Overall it is a great motorcycle road to ride! Update from "bikesand beards" on 6/13/12: All the roads in this ride are maintained fairly well. I came across no potholes, but did see a few small grooves in the road. At the start of the ride, there are some decent places to eat a quick lunch but during the ride, not many restrooms but plenty of places to stop and stretch your legs. Be sure to see Fort Donaldson Civil War battlefield in Dover before or after your ride and stop along the way to see the bison and ruins of the iron ore furnace during the ride. When you arrive there, be sure to look for Patty's a great place to eat lunch or dinner before your return ride! The address is 1801 Jh Obryan Ave, Grand Rivers, KY or you can just ask anyone there and they can tell you where they are located. Update from "bikesand beards" on 6/13/12: The Trace is full of camping...to name a few there is Piney Campground, Ginger Bay, Colson Hollow and Brandon Springs. There is a Welsome station on both ends. And there is an OHV area for all you off road riders! This route is full of historical sites, camping, animals and so much more. Enjoy the ride, ride slow. Enjoy the corners and don't miss anything. You could spend the entire day easily on this 48 miles stretch. Patti's Settlement is a great restaraunt at the end of the Trace on the right. Here there is so much to look at and eat! There is also some T-Shirt places and such...And not to far from there is the Kentucky Damn and Kenlake. on July 26, 2016 2 out of 2 members found this review useful. A Nice scenic road, the best and only route through LBL that connects with all the camp grounds and attractions. I will say that this isn't a twisty road, so those seeking tight corners and steep lean angles may find it a bit tame. It is wide and flowy with good visibility and lots of sweeping corners that become much more fun at 70 MPH. However, beware of speeding because of the heavy seasonal traffic and presence of park rangers, as well as wildlife and other legitimate hazards. I plan on bringing a dual sport next time because LBL has lots of OHV trails. on November 11, 2013 1 out of 1 members found this review useful. I completely agree with the original review of this ride. The road is clean and curvy with beautiful scenery. At the top of the Trace is Mrs. Patti's Restaurant in Grand Rivers, KY which is an incredible place to stop for dinner. The specialty of the house is pork chops like you've never eaten before in life. The restaurants has won many awards including national food magazine awards. We try to make this trip from Dickson, TN as often as possible. on April 23, 2019 0 out of 0 members found this review useful. Took The Trace last Saturday and it was the first weekend in weeks whereas no storms were hitting, meaning the ride was fairly smooth with dry roads. My only issue was that seven years after "bikesand beards" posted their review, the wear and tear from these last few years are showing. Decent route but plenty of rips and potholes closer to the southern portion of the ride. Due to my career, I was looking forward to a more adventurous ride since there were moments of straight a ways that felt like it took forever to pass. Mind the bypass since cars regularly take it, I hate slowing down and took me by surprise since it's a national park and didn't expect a highway. Beautiful route all the way through. Also if you conceal carry, make sure you pay attention to the signs at the welcome centers. on September 3, 2018 0 out of 0 members found this review useful. Beautiful ride, lots of scenery, food, and friendly people. The homeplace is a must stop for a quiet stroll. The people that work there love to share stories and talk about their work. on August 20, 2015 0 out of 0 members found this review useful. Road from Dover up to Peducha. I loved the ride while on The Trace. Seemed like I put 100 miles on in a minutes. Smooth road with few buildings and very little traffic. on March 4, 2015 0 out of 0 members found this review useful. Peaceful and very picturesque. Highly recommended on a warm, sunny day. Lots of good camping and places to stop and enjoy the scenery. on September 22, 2014 0 out of 0 members found this review useful. Mando and I enjoyed our time on the Trace. It was the first leg of our scenic tour that connected us with the Tennessee River Scenic Highway (Tn 13). on August 22, 2014 0 out of 0 members found this review useful. Nice little stretch of road. Went through here after riding the Natchez trace north. Wish I had been able to pull over and explore more. on July 30, 2013 0 out of 0 members found this review useful. This is the first route i've ever ridden (i've only been riding for about a week now). and i loved every minute of it. very light traffic and you get to see some really nice scenery too. Though I wish I would've checked the weather first, it rained quite a bit as soon as i got started. Overall i'd say it's a nice ride. on July 22, 2013 0 out of 0 members found this review useful. This was a great ride, with plenty of pretty scenery. There was very little traffic. The roads were in good shape. It is well worth your time to ride it if you're in the area. on July 15, 2013 0 out of 0 members found this review useful. Great road, with several areas for stops. Watch for wildlife. Note; NO restaurants or gas. on December 1, 2012 0 out of 0 members found this review useful. excellent ride for me as a beginner very laid back. on July 16, 2012 0 out of 0 members found this review useful. 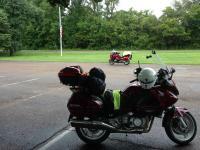 The Trace in Land Between The Lakes is a great road for riding, viewing wildlife, and the area attractions. There is camping available throughout the park and hotels, cabins and vacation rentals available just outside the park. This is one of our favorite day rides. on May 24, 2012 0 out of 0 members found this review useful. I have rode this ride many times and love it. Very scenic, good asphalt, and has the right amount of curves and passing zones. Which leads to my only negative; it's a boring ride if you get stuck behind a slow moving vehicle and horse trailers. But there are safe passing opportunities. on April 24, 2011 0 out of 0 members found this review useful. on November 24, 2009 0 out of 0 members found this review useful. I have ridden the trace many times. While on the trace you are about half way between Kentucky and Barkley lakes. If you take some of the side roads it will lead to some old ferry locations as well as many beautiful lakeshore scenes. East will take you to Barkley lake and west will take you to Kentucky lake. Be sure to keep your eyes peeled for nesting eagles as well as many other wildlife. If you exit at hwy 68/80 it is only about a 8-10 mile trip either way to the State Lodge Resort Parks. The lodges are a great place to stay with great food. You really need to make a weekend of this ride to really see it all. Great Trip!! on June 3, 2009 0 out of 0 members found this review useful. Rode this yesterday starting from the northern end. Good scenery, check out the eastern end along HWY 80/68 There's a great bridge and another state park; lake barkley. Otherwise, there are no amenities, I started at the northern end and filled up and had lunch at the end. Good ride. on February 27, 2009 0 out of 0 members found this review useful. on July 2, 2008 0 out of 0 members found this review useful. road the trace yesterday, and loved it!